Mega Scaffold (UK) Ltd is a family run scaffolding hire and erection company based in Halesowen and Cradley Heath. The majority of our projects are based around the West Midlands, including all the surrounding areas of Rowley Regis, Brierley Hill, Blackheath, Old Hill, Warley, Hagley, Quinton, Bartley Green, Smethwick, Lye, Oakham, Bilston, Bearwood, Yardley, Erdington, Edgbaston, Wordsley, Wednesfield, Wednesbury, Willenhall, Rubery, Tamworth, Tividale, Walsall, Bromsgrove, Cannock, Coseley, Coventry, Redditch, Solihull, Sutton Coldfield, Gornal, Sedgley, Wombourne, Wolverhampton, Stourbridge, Birmingham, Dudley, West Bromwich, Tipton, Sandwell, Oldbury, Staffordshire, Kidderminster, Shropshire, Worcestershire, Wollescote, Wollaston. We also travel to incorporate most of mainland UK. Please see our areas covered page for a full list of UK coverage. We cater all types of scaffolding erection for domestic scaffolding, industrial scaffolding, commercial scaffolding and leisure scaffolding. We offer our customers an emergency 24hr service and an out of hours office. This enables us to manage emergency call outs and scaffolding service requests. As an accredited scaffolding contractor we are able to erect all types of access scaffolding. This includes all types of Independent access scaffolding, scaffolding hire, scaffolding rental, handrail/edge protection, scaffolding towers, chimney scaffolds and temporary tin/monalfex roof scaffolds. Our services page will provide you with more details. Mega Scaffold (UK) Ltd prides itself in using an up to date sophisticated system of scaffold software, this enable us to provide detailed/specialised CAD/smart scaffolder drawings and quotations. 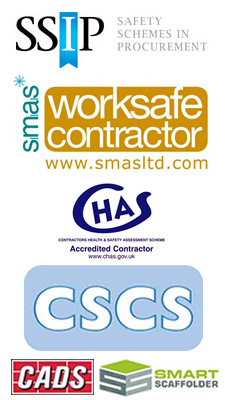 We have also acquired accreditations with CHAS, SMAS and are part of the SSIP (Safety, Schemes in Procurement) this shows our commitment to safe working practices. Designed by CONCERO UK LTD.